There came into existence a legendary beast known throughout the land as a Microdrive. This small but valiant beast was the creation of the necromancer Clive Sinclair and was his answer to the fabled Disk Drive. 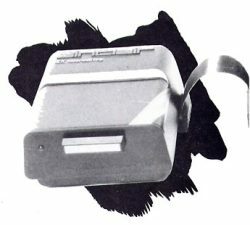 Many moons passed and finally the Microdrives appeared in the shops where previously they had only been available via Her Majesty’s package pulveriser, Sinclair pigeon post permitting. Immediately hordes of Sinclair minions dashed out and handed over their tokens of appreciation in return for the little gizmo which would make loading times a thing of the past. Software WOULD be much better because it could load in extra parts of a game at high speeds thus making the need for having the entire game held in memory immemorable. Everything looked set to turn the once humble spectrum into a ‘proper’ computer. But, dear reader, this story does not have a happy ending as it should do — it would not be right to say that the software houses abandoned our little black magic box, they never made use of its capabilities to start with. This left our poor Microdrive owners feeling sour, they had supported the industry by investing their hard earned cash but now the industry refused to support them. Some resourceful companies started publishing utilities to help our now heart broken Microdrive owner to transfer their software. Irate software houses were quick to point out that these utilities could be misused for piracy. They forgot to mention though that if they had bothered to support the Microdrive in the first place, either by marketing software on cartridge or by providing transfer options in their programs, these utilities need never have come into existence. These reviews are not intended as an in-depth article on how to put software on to drive but to suggest which of the packages available is worth buying to help you do so. The tape to Microdrive program on the Trans Express package is designed to be used by the complete novice. Transferring programs is fully automatic and all you are required to do is start and stop the tape. It transfers all parts of the program which means that loading the program back off drive can sometimes take up to a minute depending on how many parts have been transferred. Trans Express can transfer most of the early programs and a few of the ones that use software protection: it is worth mentioning, though, that Trans Express is updated every couple of months to make it better. Also included in the package are a Microdrive to Microdrive program and a Microdrive to Tape program. Microdrive to Tape is just for back up purposes, it duplicates the program onto tape though it doesn’t alter the Microdrive syntax. Microdrive to Microdrive can also be used for back up purposes but it is also a house keeping program that is able to delete files that get corrupted and to reorganise the order in which programs are stored on drive thus making loading slightly faster. VERDICT: A nice utility, especially for the novice user though at the moment a bit limited in its use. Worth buying with the Microdrive to Microdrive option. This utility is a suite of programs that are used in conjunction with each other to transfer software on to drive. The tape comes with a comprehensive booklet which, though daunting for many people to use, is informative. The programs take some time to get used to and Lerm recommend a training schedule to last over a week or so to get acquainted with them, After using this utility for a while, it is reasonably easy and the booklet teaches you a lot about Microdrives that is worth knowing. VERDICT: I wouldn’t recommend this to the complete novice but to someone who has at least a little experience with Microdrives because the booklet is easier to understand if you are familiar with false headers etc. Once proficient with the use of each of the programs on the tape, it proves a valuable utility. This is another of the automatic transfer utilities but it is slightly more advanced than Trans Express. Trans Former can cope with quite a lot of fairly recent games and most of the early games. On a few games it even offers an infinite lives option. In use it is very easy to handle, just a matter of starting and stopping tapes, a ‘Stop the tape message’ before transfer of a part of the program would have been appreciated. On most programs Trans Former gets rid of the loading screen thus saving loading time and cartridge space. One problem I did encounter though was that the program didn’t always change the loading syntax into that which the Microdrive uses but this is easily remedied by using the ‘disable the autorun’ function. VERDICT: Of all the utilities I used I think this is the one I preferred. Its ease of use means that it can be employed by almost anyone, invaluable to the novice and in some cases for the experienced Microdrive user. Like all automatic copiers, it has to be updated every few months to keep up with the latest protection techniques. ACS also offer a service to Microdrive users whereby if you send them an ORIGINAL of game you want transferred, a blank cartridge and a cheque for £2, they will transfer the game onto drive for you. This is not an automatic copier like Trans Express nor is it as hard to grasp as the Lerm one. The instructions are fairly short for this type of copier and are fairly easy to understand. It comes with a suite of programs including header reader and creator. Using these programs you transfer your software to drive which is fairly easy to do with the earlier games after a bit of practice. VERDICT: As a transfer utility this is fairly limited because it doesn’t help with the transfer of the recent Hyper loads. But apart from that with a bit of practice it should prove quite useful. The copiers reviewed fall into two distinct categories — the automatic copier and the DIY copier. The main problem with the automatic copier is that it needs to be continually updated to keep up with the latest software protection. The problem with the DIY copier is that if you don’t understand the booklet then it is of no use.